Still struggling with the name decision, but I guess I'm leaning toward Ursamarines. In the grim dorky world of my far 40K tournament future, I think it will be more acceptable to other players. Ursus Bellum sounds singular, some might need an interpretation, and it might come off like I'm just plain trying too hard. It's a tricky thing, finding something that's cool in a nerdy world, and still have it be my brand of nerdy. 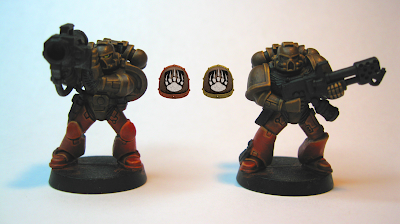 I need to work on the lighting for my pics, but below are a couple marines showing my newly finalized colors. The ML was painted entirely with this new scheme, while the flamer was painted in a different scheme and then touched up to bring in line with the new. This was more about finding the colors, and less about painting to top standard. Hopefully, my line highlights will be more careful and neat on showier pieces. Also, these obviously need a lot more work (weapons, details, etc. but I do like the eye of the ML trooper). I decided to ditch the pauldrons with a bleached bone field. They are bears...bears that have been charging through the blood of their kills, seeking more enemies to slay. Really, I wanted brown, but after deciding that most will have red legs, I found that the brown was overpowered by the huge white pauldrons. I think this will also help with the chapter symbol, a nice dark background to slap a white symbol on. I may have some vets with white helms, and some sarge's with red helms. We'll see. Because of the dark lighting, you'll definitely need to view the larger pic to see anything, and maybe even zoom in on that. Nice colors. I do like that eye! I think you need one more highlight, even brighter and thinner. Your brown is a little darker than others I've seen. I like it, but I know from experience that it runs the risk of appearing drab on the tabletop. This is going to be a cool looking chapter, and I do like Ursamarines. Or Ursa Marines? Hey, you went back and added the floating pauldrons didn't you? They look flipin' sweet. I'm really digging the bear paws. Would you consider embossing them? you know, on my laptop, they look a lot brighter than they did at work...maybe I'm wrong about that extra highlight? yes...i just got a hardcopy of the Eldar codex. It should make for good reading this weekend...just like Rommel's tank tactics book did for Patton in Africa. Mmmwwahahhaha, suffer not the alien. Actually, I'd like to suffer the alien Eldar sometime in the future. I really like that box of Striking Scorpion models, and others, and the Eldar armor is nice to paint. Since I move at glacier pace and can't seem to focus on just one thing, it would probably be 10 years before i was able to start an Eldar army. Maybe I'll just buy the scorpions and paint them, then let you take them...until that day when I'm ready. Yeah, I popped in the pauldrons just to help visualize. I think I'm leaning toward gold, but one that works up from a dark coppery gold and is highlighted by shinging gold and not mithril siver. 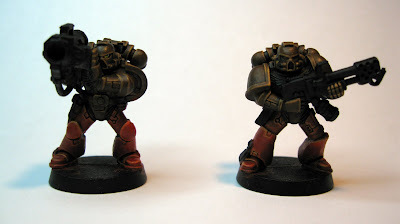 I don't believe I like the technique of highlighting gold with silver, I'd rather start darker and end darker, less flashy. well, you might be right about the extra HL. I'm looking at it right now...I'd say it makes table top standard, but on special pieces I'd add several steps, one being a few more bright spots.